Updated December 2018: Positions filled. Check back for 2020! 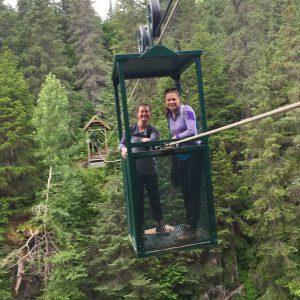 Trustees for Alaska, a public interest environmental law firm with a busy and diverse docket, is now accepting applications for legal interns to work full-time for ten weeks in the summer of 2019. Start and end dates are flexible. These legal internships pay $15 an hour. Academic credit is possible. 2018 interns Maggie Massey and Jenna Lewis get a life during a day hike. Trustees has been working to protect Alaska’s environment for over 40 years. We provide counsel to local, regional, and national conservation organizations, tribal councils, Alaska Native groups, fishing organizations, and other individuals and organizations concerned with environmental and natural resource matters. Trustees’ work generally focuses on state and federal legal issues concerning clean water, public lands and wildlife, climate change, coal mining and combustion, marine resources, and hard rock mining. Trustees provides a unique range of public interest law experience to its interns, who conduct legal research and writing, draft pleadings and arguments, write comments to administrative agencies, assist with preparation for arguments in federal and state court, interact with clients, and do other legal and communications work. Interns will have the opportunity to work closely with Trustees’ six staff attorneys on all aspects of litigation and on projects that could involve the Clean Water Act, the National Environmental Policy Act, the Endangered Species Act, and various federal public land management statutes. Read first-hand accounts of our past interns’ and externs’ experiences with Trustees. Trustees is hiring two 2L or 3E law students. The ideal candidate will have excellent writing, research, and analytical skills, solid interpersonal skills, and a commitment to public interest law and the environment. Law students with coursework in administrative and environmental law are strongly preferred. Applications are reviewed on a rolling basis and positions are open until filled. Students are encouraged to apply as early as possible. Electronic applications may be sent to Ashley Boyd at aboyd@trustees.org. Please include a cover letter, resume, transcript (unofficial or official), short writing sample, and list of three references with contact information. No phone calls, please.